It’s been over a decade since Lightning McQueen found himself broke down off Route 66 in the hick town of Radiator Springs in the film Cars. One sequel, two spin-off films, several short films, and a theme park land later, the time has arrived for the third film in one of Pixar’s beloved trilogies as Cars 3 comes to theaters June 16. The film follows hotshot race car Lightning McQueen (voiced by Owen Wilson) enjoying his career with his fellow racers, until the next generation of high-tech racers join the races. McQueen quickly sees his career fading away as he finds himself continually losing to arrogant next-gen racer Jackson Storm (voiced by Armie Hammer). Pushed to his limit against the faster Storm, a devastating crash forces McQueen to reevaluate his future. His new sponsor, Sterling (voiced by Nathan Fillion), pairs him with an ambitious but inexperienced racing technician named Cruz Ramirez (voiced by Cristela Alonzo). Together, McQueen and Ramirez try to find the right training for McQueen to get back on top, while McQueen also wrestles with the fear of following the same forced retirement as his mentor, Doc Hudson. True to Pixar form, Cars 3 dials up the emotions as we sympathize with McQueen’s plight to keep up with the younger generation and feel similarly helpless at knowing exactly how to achieve this. Owen Wilson returns as the flawed character of Lightning McQueen, who once again allows his ego and quest for winning to get the better of him. Balancing McQueen’s character this time around is Cruz Ramirez, who gives lovely naivety and optimism to the story and might have the answers to securing McQueen’s legacy. Cruz Ramirez not only adds a lot of humor and heart to the story, but her career journey also reflects what many people struggle through in achieving their dreams if they started out in non-traditional ways. I personally love when animated films infuse poignant social messages like this, in ways that are both tangible to kids and adults. And Alonzo portrays the character wonderfully, clearly taking elements from her own life to fuel Ramirez’s feelings of “not belonging” in the world of racing. Bringing back all the heart and friendships of the original movie, Cars 3 succeeds in a way that will make the franchise proud. The film also reintroduces the late Paul Newman back in flashbacks of Doc Hudson, making use of audio recordings left over from the first movie. Not only for nostalgia, but Doc’s presence in the story is all the more important to McQueen’s journey. We even delve into Doc’s backstory to meet his mentor and friends. Families and children, young and old, will surely be inspired by the film’s messages: Follow your best road, even if it’s not the one you would go down; and never let anyone tell you when to quit. 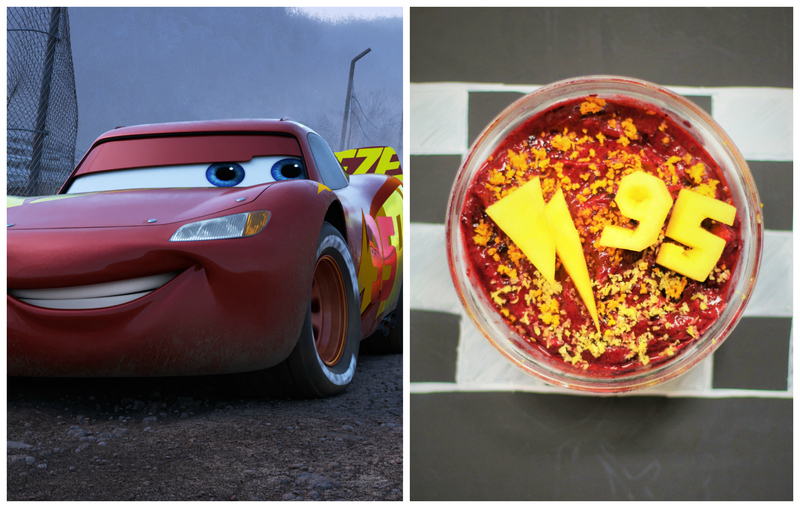 For the Cars 3 Recipe & Review, I decided to make a vegan smoothie bowl inspired by Lightning McQueen! This smoothie bowl is packed with cherry and pineapple, perfect for the start of summer! It’s topped with orange and lemon zest to look like Lightning’s racing stickers, and complete with a lightening bolt and 95 cut out from mangoes. This smoothie bowl makes for the perfect pre- or post-movie snack when you see Cars 3, now in theaters! You can get the full recipe for the smoothie bowl here.